A scholarship for current domestic undergraduate students studying advertising. mentoring by an industry professional aligned with the Brisbane Advertising Association. have no more than 12 months remaining on plan to complete the degree at the start of 2019. Applicants are to complete and submit the one-page application form along with a video cover letter addressing four main questions. aptitude and passion for advertising and business. If you're shortlisted, we'll invite you to attend an interview with the selection panel. Whether you're successful or not, we'll send you written confirmation of the outcome of your application. There is no appeals process for unsuccessful applications. Read the terms and conditions (PDF file, 170.7 KB) for this scholarship. This scholarship is proudly supported by the Brisbane Advertising Association. 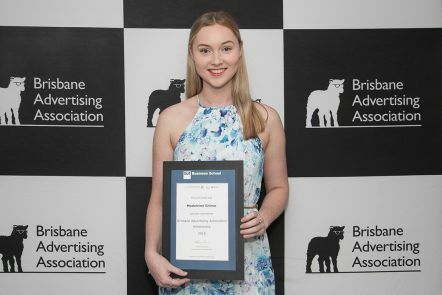 The Brisbane Advertising Association (BAA) was founded in 1989 by a group of prominent industry identities and is essentially a charitable organisation. It currently has over 150 financial members drawn from advertising agencies, all sectors of the media, marketing professionals, associated industries and specialist service providers.